A Russian Tupolev Tu-204 belonging to Red Wings had to turn back immediately after taking off from Ufa in Russia on Wednesday after a fire in one of its engines. The dramatic incident was caught on video by one of the passengers on flight 808 heading to Sochi, which has been posted to social media. Sparks and flames can be seen emanating from the left-hand engines just moments after taking off at 1704 local time. From early reports, the pilots of the Tu-204, registration RA-64050 were alerted to the fire by both a fire warning alarm in the cockpit and by air traffic control at the airport. The Pilot requested an immediate return to the airport as the engines inbuilt fire extinguisher failed to quench the flames. Some passengers recorded the incident on mobile phones, whilst others seemed panicked by the unfolding situation, however, most remained surprisingly calm. The aircraft, which is nine years and four months old then landed a few minutes later and was greeted by a full complement of the Ufa's fire service. In one of the videos, jets of foam can clearly be seen spraying over the affected engine, dousing the flames successfully as well as the fuselage. Passengers and crew evacuated the aircraft via emergency slides once the fire was put out and no injuries have been reported. View of the unfolding drama from the ground was also captured. 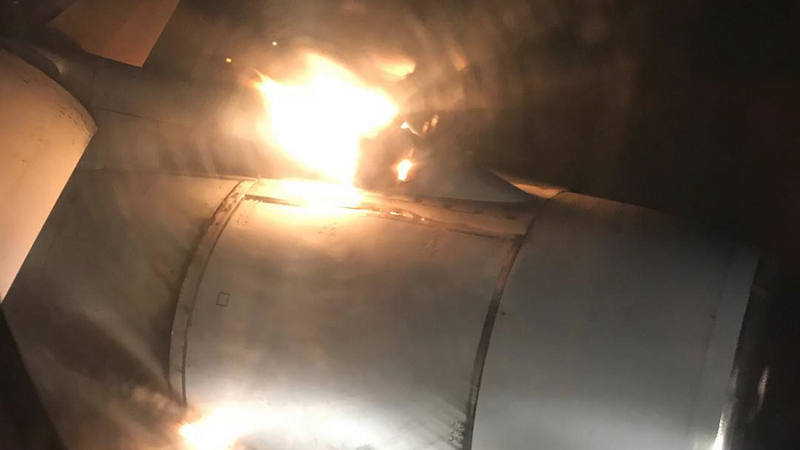 An investigation has been launched into the causes of the fire, however, preliminary examinations of the Perm PS-90A engine seem to have discounted the possibility of a bird strike or other injestation of a foreign object.